CAPE CANAVERAL, Fla. -- NASA's next mission to Mars has made one small step for a robot -safely arriving here in Florida via a cargo aircraft. The Phoenix Mars landeris now undergoing its first checkouts for a sendoff to the red planet in August. AU.S. Air Force C-17 cargo aircraft transported Phoenix from Buckley Air ForceBase, Colorado to Florida on May 7. The Mars probe was caravanned by truck tothe base in a nitrogen-purged container, dispatched from the Mars lander'sbuilder, Lockheed Martin Space Systems Company in Denver. 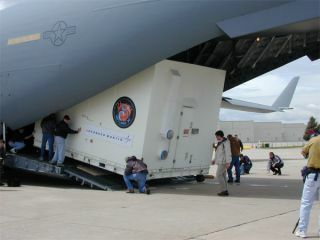 Inan orchestrated dance of "loadmasters", Phoenix and associated hardwarereceived tender loving care as they were tucked within the cavernous C-17 forshipment to the Kennedy Space Center's Shuttle Landing Facility in Florida. Insidethe chained down, sensor-laden, nitrogen-purged container, Phoenix itself was"double-bagged" said Tim Gasparrini, an engineering manager for Lockheed MartinSpace Systems. That container maintained the spacecraft in a dry and cleanstate so that it can perform its science when it gets to Mars, he added. Herein Florida, work is also underway in prepping the booster for Phoenix - aBoeing-built Delta 2 rocket, handled under the auspices of the newly formedUnited Launch Alliance. Targetedfor an early August liftoff, Phoenix will cruise through space then land on aMartian arctic plain in May 2008. The robot is outfitted with a powerfuldigging arm and other instruments to determine whether the soil environmentbeneath the surface in that location might be a cozy hangout for microbiallife. As Phoenix was being prepared for airlift from Colorado to Florida, Ed Sedivy, Phoenix program manager at Lockheed Martin Space Systems, paced about the tarmac like anexpectant father. "It'san exciting day," Sedivy told SPACE.com. "There are only a handful ofdays when you are this excited. The day you win [the spacecraft contract]...theday you ship...the day you launch...and the day you land." Theflight of the Phoenix includes a nine-and-a-half month cruise to Mars, followedby a three month primary mission on Mars' surface, Sedivy noted. TheMars lander was delivered to Florida folded inside its back shell and is nowparked within a payload processing facility with its gold-colored wrappingsremoved May 8th. The first checkout activity will be a spin-balancetest May 10 and 11. Amajor milestone, toward the end of this month, will be a landing radar integrationtest and launch system verification test. The last week of May will include anentry, descent and landing system verification test, followed by a guidancenavigation and control test. The Phoenix flight landing radar is a very complicated piece of equipment, Sedivysaid. "It's an interesting technical challenge in itself." Thatstill-to-be-delivered critical hardware, built by Honeywell of Minneapolis,Minnesota, is a derivative of radar utilized by an F-16 jet aircraft. Tests areongoing to meld landing radar hardware and software with results of drop testsand simulations of martian real estate that Phoenix will encounter on touchdownday. Sedivysaid that camera sweeps by NASA's Mars Reconnaissance Orbiter (MRO) using itsHigh Resolution Imaging Science Experiment (HiRISE) have helped pick a Phoenix landing zone. Digital elevation maps of that zone have been produced, although morework is still to come to plot out the true landing footprint for Phoenix, he added.